Breathaplasta is a quick setting lime plaster that is a higher performance and healthier alternative to mainstream plaster products and offers you a range of natural lime plaster finishes from smooth lime plaster skim applications to textured finishes and super-textured feature walls. Breathaplasta is also an ultra-breathable lime plaster that regulates moisture and helps reduce problems with condensation and mould. Breathaplasta provides high thermal performance, moisture regulation and acoustic insulation for better living comfort, has excellent fire performance and a lower environmental impact compared to mainstream plaster products. Whether you are looking for a renovating plaster to refurbish an old or listed building or you are building new and are looking for a fast setting lime plaster, Breathaplasta provides an easy solution to creating a healthy living or working area. Hygrothermally high performing, Breathaplasta is a lime plaster that regulates moisture and improves insulation to deliver a healthier and more energy efficient environment. Breathaplasta is quick setting, quick drying and easy to use and gives you a beautiful lime plaster finish. 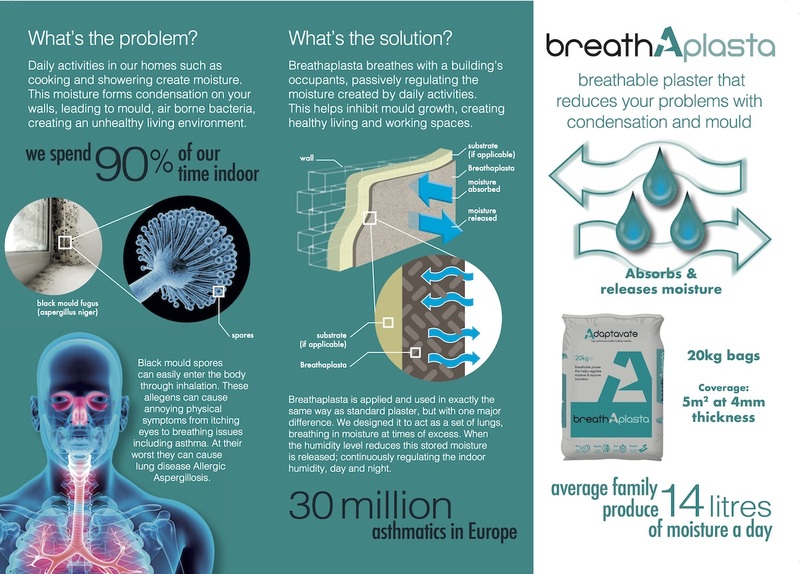 Visit our resources section for technical support and installation guides or to read more about how Breathaplasta eliminates condensation and mould. Have a question? Visit our FAQs page or call us directly on 01453 827800. Want to buy Breathaplasta? Click on the link to visit our stockists map and find a merchant near you. Breathaplasta is easily specified and installed in a wide variety of projects and surfaces.